It was once visited by Queen Victoria and King Edward VII and despite surviving two world wars and a fire it was finally demolished by a scrap merchant in 1949. Now developers are looking to discover the hidden history of Worsley New Hall in Greater Manchester. The Peel Group, which owns the site in Salford, plans to develop the land as a golf course and hotel and wants to bring the hall's Victorian gardens back to life. Strategic planning director for the Peel Group Peter Nears said: "We will be looking at the future potential of the New Hall site, particularly the restoration of the terraced gardens which were designed by renowned landscape architect William Andrews Nesfield." The hall was designed by architect Edward Blore and the original drawings and plans are held at the Victoria and Albert Museum. He added: "We hope the research project will bring together the history of the hall from across the country. "The dig at Worsley Hall site will be a community archaeological project and we hope local people and schoolchildren will take part." 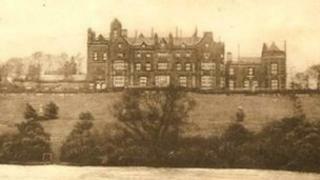 Originally owned by the Bridgewater family, the hall only lasted from 1846 to 1949. During that time it was visited by Queen Victoria in 1851 and 1857 and King Edward VII and Queen Alexandra in 1869 and 1909. It was used as an officers hospital in World War I and again in World War II when it housed Dunkirk evacuees, American soldiers preparing for D-Day and the Lancashire Fusiliers. In 1943 the hall was badly damaged by fire and riddled with dry rot and was finally bought by a Mr Littler, a scrap merchant from Ashton-in-Makerfield who demolished it. A trial archaeological dig in December revealed the basement of the hall still exists and the company is now funding research into the history of the site. A second dig will start in May 2012 and the group is working with the University of Salford's Centre for Applied Archaeology to record their findings online. Chief archivist at the university Ian Johnston said: "We are looking to employ a researcher to bring together all the information about the hall. "This funding will let us explore a major part of local history in a level of detail which has never been done before. "We are very grateful for the opportunity to conduct the research which we'll be able to preserve in digital form for the benefit of future generations."